Dr. Rachna Arora is a psychologist, counsellor, poet, blogger, a happy wife and mother, who realized that for many married women the phrase “happily married” is just an oxymoron. With a PhD in Psychology and years of counselling experience, she is actively involved in assisting married women in coping up with the challenges of married life and helps them find solutions to their problems, enabling them to live a happy and fulfilled life. 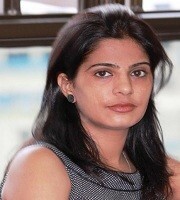 She is also the Co-founder of thehappywomen.com, an online platform to empower, motivate and inspire women. At The Happy Women, she provides online counselling to women of all ages. She feels highly satisfied in helping women assert themselves and helps them understand their needs and preferences in life, so that they become truly empowered.